There's been a bit of a misnomer about my reputation among certain corners of the OSR. I've been called everything from an 'Old School Renegade' to an 'Old School Resurrectionist' to that 'old fool'. Well, perhaps I'm a bit of all of those things & more. The commentary I'm offering seems to be scoffed at in some corners. So what. I'm here for the OSR readers & subscribers but more over the players as well. The fact is that sometimes implying gonzo & crazy adventure elements are far better then just dropping giant robots & other pulp elements into an adventure. Now I've been talking about Arduin for the better part of a week. For over a year of near constant weekend & weekly play we'd worked are PC's in the shape that the campaign setting called for. 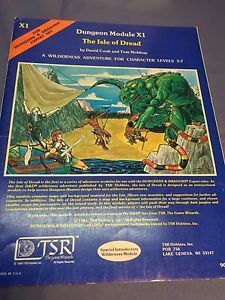 take the dungeon master through all of the necessary steps to get the PC's hooked into the action on the isle with an emotional investment in the fate of the whole place. Dave Hargrave did similar in his own home campaigns from what I understand & the fact is that just the right amount of world building comes into play here. Hands off lets the dungeon master have the players build the campaign on their own. Expand the horizons of the player's PC's by offering opportunities for growth vs death. This is something that has to do not with leveling up but letting the player think his way out of a trap or dangerous situation. Plan with pulp adventure elements in mind but don't over think an adventure. If you find yourself scripting the adventure instead of running it then you might be over thinking it. History & real world elements off set the nature of the fantastic or crazy. Ruined devices or set pieces wouldn't destroy a campaign. Adventurers have always been there before the PC's & their dead always use others before to add depth to the campaign world setting. Plus you can loot the bodies. Keep the adventure simple at first the players will complicate it as they go on. Play styles are going to differ so you can expect lots of lapses & even possible set back. Offer only hints & clues with artifacts, devices, and tricks never take a hand. This is the player's game. Death always lurks around the corner in Pulp games an NPC death is something unexpected and will frighten players. Expand on the setting only as needed. Keep the adventure setting simple & easily designed. Horror,death, and destruction are going to happen expect them. Court them and use them as tools for the game but not gregariously. Let the players grow & the PC's level as needed. Take the pulp elements in stride and don't over explain anything let the players fill in the gaps.